This story of a church's revitalization counters a common misconception that a church's size determines its health, and points pastors to the faithful ministry of God's Word. This latest addition to the IX Marks series tells the story of the revitalization of Guilford Baptist Church in northern Virginia. Weaving together scripture and biblical principles with humour and personal anecdotes, author Michael McKinley asserts that a pastor's faithful exposition of God's Word, passion for sharing the gospel, and care in the training of other godly leaders are more important than the size of his church. McKinley honestly shares his own fears and rookie mistakes, along with encouraging stories of how God moved at Guilford Baptist. We are reminded that God uses weak and fearful pastors, inplants, and revitalizations; church planting is indeed for "wimps". For pastors and seminarians considering a church plant and those already struggling in their own fledgling congregations, this book is a thoughtful and encouraging resource. 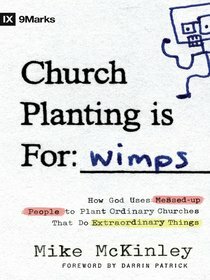 About "Church Planting is For: Wimps"
This latest addition to the IXMarks series tells the story of the revitalization of Guilford Baptist Church in northern Virginia. Weaving together scripture and biblical principles with humor and personal anecdotes, author Michael McKinley asserts that a pastor's faithful exposition of God's Word, passion for sharing the gospel, and care in the training of other godly leaders are more important than the size of his church.